Cancer of the spleen is very rare to occur in human. However, this kind of cancer needs attention because spleen is important organ and cancer in the spleen could grow into life threatening stage. Spleen is essential for drainage network of body. The main function of the spleen is to produce white blood cells to work against infection. Spleen is also essential in filtering abnormal blood cells from the stream of blood. Spleen contains lymphatic tissue and cancer that starts in spleen is lymphoma. Lymphoma that starts in spleen is very rare. Most time, cancer of the spleen is lymphoma that occurs elsewhere than invade spleen. One common type is leukemia. It starts in the bone marrow and spread to spleen. The other common types of cancer that spread and metastasize to spleen are lung cancers, liver cancers, stomach cancers, colon cancers, and pancreatic cancers. 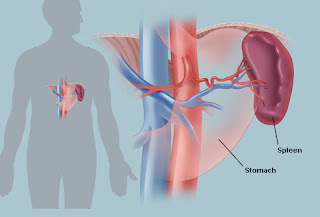 Although very rare, it could lead to complication and rupture of the spleen. When it occurs, immediate medical care is imperative. Early symptom of spleen cancer is similar with those of a cold and become the main reason why cancer of the spleen is rarely to be detects early. After the cancer grows, symptoms that are more specific may occur as the spleen enlarged. The noticeable symptoms are including the feeling of fullness in the upper abdominal area and sometime it feels painful. Then, the symptoms may grow into pain in the joint and bone, fatigue, fever, chills, night sweats, frequent infections, sudden weight loss without reason, easy to bruise, easy to bleed, and swollen lymph nodes. It could be life threatening when the spleen is ruptured. The symptoms are including chest pain, rapid heart rate, breathing problems, several abdominal pain, blue lips, blue fingernails, behavior change such as hallucination, and unresponsiveness or passing out. Before spleen cancer grows into life threatening stage, it should be treats immediately. The options are various including biological therapy, chemotherapy, radiation therapy, surgery, targeted therapy, and stem cell transplant. Doctor will recommend the best therapy possible after getting accurate diagnosis. When treated early and comprehensively, cancer of the spleen could be permanently cured.